If you love the good old fashioned Christmas carols from when you were a kid, you will love these Christmas songs on the piano. Each one of them is a favorite of mine that I learned as a child and I’ve tried to recreate them as closely as I could. Christmas carols are such a part of the holiday season regardless of how you celebrate it in my view. They help ring in the season with glad tidings of joy and peace to all. The music just seems to fill the winter landscapes of snow (or tropical trees and plants if you live in Florida like I do). They are and will always be classic Christmas songs to me. I hope you will enjoy the wonderful piano arrangements I have created for this CD. 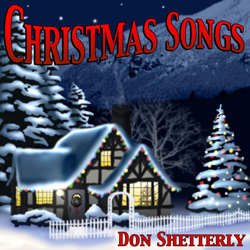 My name is Don Shetterly and I create relaxing piano music. No, this is not electronic music created on the computer like so many do. All of it was created using my Yamaha P120 Keyboard. All of these songs are available on many of the digital music sites. Each one of these Christmas songs played on my piano come from a deep place within my heart. You’ll recognize the joy and peace and serenity as you hear the notes come together in harmony. Everyone celebrates Christmas in different ways, but music joined with all the lights of the season, make the holiday a magical time of year. Many times while growing up, I not only played this beautiful Christmas songs for church, but I played them for family gatherings and in nursing homes. There were favorites then and they still are in my life. There are no special effects on these songs and everything is recorded as it is played. I wanted the music to be pure and simple so that it added joy and peace to Christmas and the holidays. I take pride in how this music sounds. I know that if it touches my heart deeply, it will touch your heart equally as well. May this music help fill your house with the peace and joy of Christmas as you celebrate it in the traditions of your own family.